Losing weight can be very difficult, especially during menopause. Many women tend gain few extra pounds during this time, whether it is from lack of physical activity, unhealthy foods, poor beverage choices, or simply hormonal imbalance. Although most individuals understand the importance of water, only one-third of Americans drink adequate amounts daily. This is closely linked to rising obesity rates among children and adults alike. Some people worry that water will be retained as extra pounds, but in fact, water is absolutely essential for losing weight and maintaining a healthy body, and there are several reasons why you should get into the habit of drinking more water. If you are struggling with your weight, you may find that you impulsively snack on things. Acting on cravings, you may opt for something in the moment that you know is not good for you at all. Next time this happens, fill a cup of water. Water fills you up, and often when you think you want a snack, you are actually just thirsty. Instead of adding calories, sugars, and fats that your body doesn't need, water will help burn calories and keep you hydrated. Sugary drinks - including soda, iced tea, lemonade, fruit punch, sports drinks, and even 100% fruit juice - are a large part of the reason why two out of three adults in the United States are obese. Studies show that 50% of Americans drink sugary drinks daily, 25% of them get 200 calories daily from sugary drinks, and 5% consume around 560 calories of sugary drinks. The average can of soda contains 150 calories and 10 teaspoons of sugar. 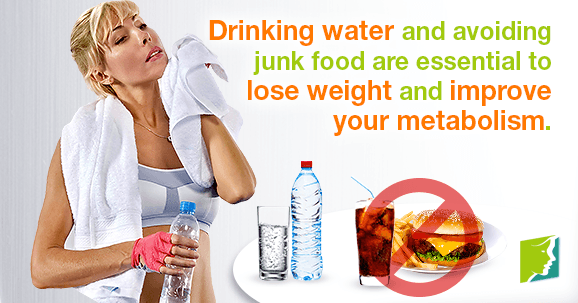 Studies show that simply replacing caloric drinks with water results in 2 - 2.5% weight loss. When you are dehydrated, as most people often are without realizing it, your metabolism is significantly slowed. It slows down as a survival function to conserve energy. A slow metabolism makes it harder to digest food and lose weight. Your body absolutely needs water to function properly. Some studies report cold water to assist metabolism even more than hot water, so have chilled water in the morning, before meals, after exercising, and before sleep. If you are exercising without enough water, you are working against yourself. Dehydration slows your ability to burn fat and calories. Also, when you work out, you lose water through sweating. When you do not drink water, the body's water supply will not be adequately replenished. Water also keeps your muscles from getting tired quickly during a workout and reduces soreness post-workout. About 60% of the body and 75% of the brain is composed of water. Two to three quarts of water are lost from the body daily through urination, sweating, and even breathing. When you do not replace your fluids, your body will become sluggish, fatigued, and more likely to retain fat. In addition, you can get headaches, muscle cramps, and light-headedness. It is essential that you drink the equivalent of 8 - 10 glasses of water daily if you want to lose weight. Not only will it burn calories during the process, it will also assist additional fat burning during exercise and improve digestion. For more information on weight gain during menopause and how to treat it, follow the links below.